The wiper will sweep due to the power from the green cable, however it will stop at the park position if the console switch is not on (guess there must be a break in the contact / track). If the console switch is in the off position the green/black wire is grounded which stops the motor at park. Checking my switch (951 613 113 00) when in the on position, it correctly routes power to the green/black cable at the motor. However when it is in the off position there is no continuity to earth. My question is should there be ? The diagram on the side of the switch would indicate there should be. Thought I'd check though before opening the switch up and trying to fix it (or buy another one). Motor--Black/Green to 53 ,Green to 53a ,Brown to 31. Switch--Black/Green to 2 ,Green to 6 ,Brown to 5 . The motor is like the Headlamp motor having an extra track supplied by the permanent live Green which carries on supplying a live feed to the motor when the wiper switch is switched off allowing the wiper to park when the green feed is interrupted by the break in this track. 1966 MGB GT B Racing Green. Looks like mine is wired up the same as yours then and the rear wipers have the same operation. Given that my switch is wired up with a brown (earth) fitted to it to, the switch must be faulty as no connection is made to the brown when the switch is off. I'll have a look inside it and/or get another one. I've read your posts carefully again & I don't think there would be any connection via the switch to earth when switched off such that the Black/Green is grounded-all that would do is blow the fuse. b)The Green supplies a continuing live to the extra track until the wiper is in the park position where the extra track gets it's live feed interrupted & as the switch is already OFF ,the wiper stops. Without trawling through my wiring diagrams,etc I don't recall the actual wiring but IIRC,isn't there more than one wire to some of the switch terminals? If I get time later I'll look through my Technical Info file I keep of actual jobs tackled. Thanks for taking the time on this one Colin. I agree with you regarding likelihood of blowing a fuse if the green/black wire is earthed, however the diagram on the switch shows this connection being made in the off position (and the workshop manual also shows it). Also would there be any need for the brown wire at the switch at all if it's not being connected to anything (apologies if this is a daft statement - electrical isn't my strong point !). Colin from R2 has PM'd me and has a spare that I can try. Thanks for the offer though - appreciated. Andy-after my last post,I reflected on the arrogance of my statement & quietly studied my circuit diagrams again so I amend my conclusion. 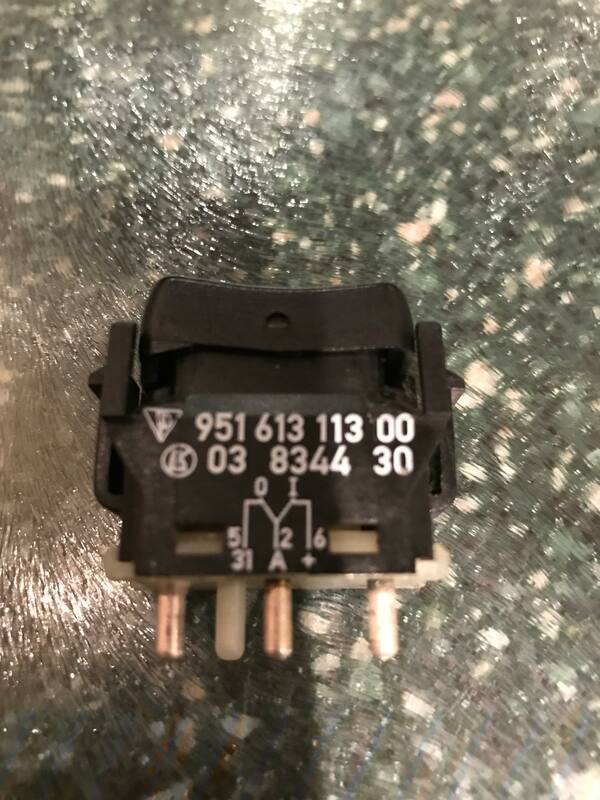 Because of the wiring link in the green circuit,it looks like this permanent live links to the Black/Green motor wire to power the wiper when it's switched on & powers the wiper using the direct motor connection when switched off using the brown wire at the switch in the circuit. Actually ,without constant revision,I don't think I will ever master these porsche currentflow circuit diagrams. Hope you get it all sorted out -one needs the rear wiper in Autumn & Winter.